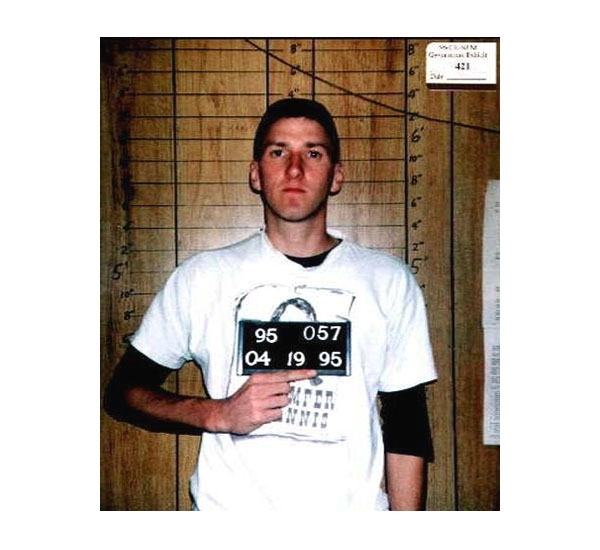 Oklahoma City bomber Timothy McVeigh was arrested by the Oklahoma Highway Patrol in April 1995 for carrying a loaded firearm after he was stopped for having no license plates on his car. Days later, McVeigh, 26, was identified as the person responsible for the bombing of the Alfred P. Murrah Federal Building that killed 168 and injured more than 850 people. In June 1997 he was found guilty and was executed by lethal injection in June 2001 at the U.S. Federal Penitentiary in Terre Haute, Indiana. Submitted by blkhummerman on Wed, 2011-05-11 14:22. Submitted by kane's the name on Tue, 2011-05-03 10:50. Submitted by clairpie on Tue, 2011-03-15 14:57. I hope he suffers for eternity. Submitted by BigEone on Fri, 2010-11-05 18:00. Submitted by TimothyMcVeigh on Sun, 2010-10-10 21:26. Submitted by lisasmurf on Sat, 2010-10-09 19:13. Submitted by lmowery on Fri, 2010-10-01 12:07. What a skinny, awkward, pathetic loser. Submitted by GeorgeDubyaBush on Thu, 2010-09-30 11:43.